This project is a cooperation between Technische Universität Dresden and University of Rostock. It is supported by the DFG (Project numbers: DA 1319/3-1, SCHU 887/14-1). Graphs have an important role in different application areas. For example in social network analysis or to depict biological relations in systems biology. 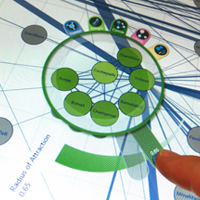 Known visualization approaches focus primarily on graph exploration and use mouse interaction techniques. 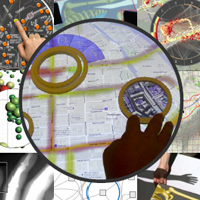 The goal of this project is to support exploration and manipulation similarly through multiple interactive surfaces and novel interaction modalities. Graphs are often interactively created. One example is process modeling. In other applications graphs are being visually explored. For example in the area of social networks. 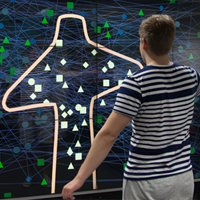 It shall be analyzed how far interactive displays can bring together exploration and interactive manipulation to open new possibilities for novel applications. Modern interactive displays support both presentation and interaction and thereby reduce the cognitive distance between input and output. This potential shall be used to allow a continuous transition between presentation and interaction and to provide novel options for direct manipulation and exploration of complex graphs. The use of tabletops and small additional displays (magic lenses) simultaneously enables the combination of views with different resolutions with multiple interaction techniques. This potential shall also be used for the analysis of complex graphs. and the Technische Universität Dresden. is the head of the Interactive Media Lab Dresden (Professorship Multimedia Technology, Dresden University of Technology). He is responsible for teaching courses, supervising students and conducting research projects. His background and research interests are an intersection of computer graphics, human computer interaction and information visualization with a solid foundation in software engineering. He is interested in research topics in the area of smart and seamless user interface experiences by means of natural interaction techniques. This also includes novel ways of information visualization and 3D interaction. is a professor at the Institute for Computer Science at the University of Rostock, Germany, where she heads the Computer Graphics Research Group. Her research and teaching activities cover a number of topics related to computer graphics, particularly including information visualization, visual analytics, and rendering. More specifically, she is interested in the visualization of structures and multivariate data in space and time, in the design of scalable visual interfaces, and in terrain rendering techniques. Her current research projects are funded by public agencies and industry and span from fundamental research (e.g., scalable visualization methods and visual interfaces for smart environments) to applied research (e.g., computer graphics in the cockpit and visualization of bio-medical data). Heidrun is co-author of the first German textbook on visualization. is a lecturer and researcher at the Institute for Computer Science at the University of Rostock, Germany. Together with his colleagues from the Computer Graphics Research Group, Christian has authored and co-authored several articles on new visualization and interaction concepts as well as on aspects related to the software engineering of information visualization techniques. His current research interests are the visualization of multivariate data in time and space, the visualization of graph structures, and the promising opportunities of utilizing novel display and interaction devices for visualization. He is particularly interested in the role of interaction for the visual exploration and analysis of data. Christian developed a number of visualization systems and tools, including the LandVis system for spatio-temporal data, the VisAxes tool for time-oriented data, and the graph visualization system CGV. is a research and teaching assistant at the Multimedia Technology Group / Interactive Media Lab at the Faculty of Computer Science of Dresden University of Technology. His research interests include human-computer interaction (in particular, multitouch and pen interaction), information visualization and all kinds of diagramatic modeling and graph visualizations. is a Ph.D. student at the Interactive Media Lab Dresden working in the field of human-computer interaction. 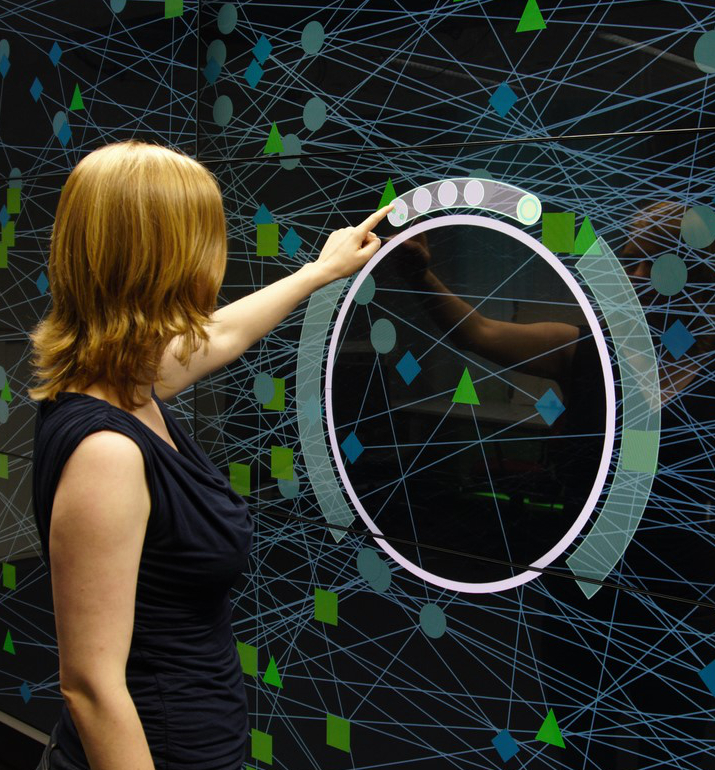 Her main focus is pen and touch interaction on large interactive surfaces, as well as development of tangible user interfaces. is a Ph.D. student at the Computer Graphics Research Group at the University of Rostock in the field of information visualization (especially graph visualization). His main focus is on graph exploration. The following publications are results of this cooperation. These publications (including pdfs) can also be found at the individual websites of the Chair of Multimedia Technology and the Chair of Computer Graphics. Gladisch, S.: Supporting Graph Editing in Visual Representations. Dissertation, University of Rostock. (to be defended on July 1, 2016). Kister, U; Reipschläger, P; Matulic, F; Dachselt, R.: BodyLenses - Embodied Magic Lenses and Personal Territories for Wall Displays. Proceedings of the 2015 International Conference on Interactive Tabletops and Surfaces (ITS), 117-126, Funchal/Madeira, Portugal, 2015. 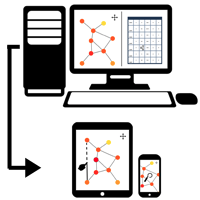 Kister, U.: Supporting Interactive Graph Analysis Using Adjustable Magic Lenses. Doctoral Symposium accepted for the ACM International Conference on Interactive Tabletops and Surfaces (ITS), 469-474, Funchal/Madeira, Portugal, 2015. Langner, R.; Kister, U.; Engel, C.; Horak T.; Dachselt, R.: Towards a Fluid Interaction Concept Bringing Star Plots to Interactive Displays. Proceedings of the 2015 International Conference on Interactive Tabletops and Surfaces (ITS), 349-354, Funchal/Madeira, Portugal, 2015. Gladisch, S; Kister, U; Tominski, C.; Dachselt R., Schumann H.: Mapping Tasks to Interactions for Graph Exploration and Graph Editing. Poster at IEEE Conference on Information Visualization (InfoVis), Chicago, USA, 2015. Gladisch, S; Schumann, H.; Luboschik, M., Tominski, C.: Toward Using Matrix Visualizations for Graph Editing. Poster at IEEE Conference on Information Visualization (InfoVis), Chicago, USA, 2015. Gladisch, S; Kister, U; Tominski, C.; Dachselt R., Schumann H.: Mapping Tasks to Interactions for Graph Exploration and Graph Editing on Interactive Surfaces. arXiv:1504.07844 [cs.HC], 2015. Gladisch, S. & Tominski, C.: Toward Integrated Exploration and Manipulation of Data Attributes in Graphs, Poster at IEEE Conference on Information Visualization (InfoVis), Paris, France, 2014. Kister, U.; Reipschläger, P.; Dachselt, R.: Multi-Touch Manipulation of Magic Lenses for Information Visualization, Proceedings of the 2014 ACM International Conference on Interactive Tabletops and Surfaces (ITS), Dresden, Germany, 431-434, 2014. Morawa, R.; Horak, T.; Kister, U.; Mitschick, A.; Dachselt, R.: Combining Timeline and Graph Visualization, Proceedings of the 2014 ACM International Conference on Interactive Tabletops and Surfaces (ITS), Dresden, Germany, 345-350, 2014. Tominski, C.; Gladisch, S.; Kister, U.; Dachselt, R. & Schumann, H.: A Survey on Interactive Lenses in Visualization. EuroVis State-of-the-Art Reports, Eurographics Association, 2014. Gladisch, S.; Schumann, H.; Ernst, M.; Füllen, G. & Tominski, C.: Semi-Automatic Editing of Graphs with Customized Layouts. Computer Graphics Forum, Vol. 33, No. 3, 2014. Hincapié-Ramos, J.; Roscher, S.; Büschel, W.; Kister, U.; Dachselt, R.; Irani, P.: tPad: Designing Transparent-Display Mobile Interactions. Proceedings of the 10th ACM Conference on Designing Interactive Systems.DIS '14, Vancouver, BC, Canada, 2014. Hincapié-Ramos, J.; Roscher, S.; Büschel, W.; Kister, U.; Dachselt, R.; Irani, P.: cAR: Contact Augmented Reality with Transparent-Display Mobile Devices.Proceedings of the 3rd International Symposium on Pervasive Displays.PerDis '14, Copenhagen, Denmark. 2014. Büschel, W.; Kister, U.; Frisch, M.; Dachselt, R.: T4 – Transparent and Translucent Tangibles on Tabletops.Proceedings of the 12th International Working Conference on Advanced Visual Interfaces 2014.AVI '14, Como, Italy, 2014. Gladisch, Stefan; Schumann, Heidrun; Tominski, Christian: Navigation Recommendations for Exploring Hierarchical Graphs, Advances in Visual Computing, Proceedings of the ISVC 2013, No. 2, pp. 36–47, Springer, 2013. Spindler, M.; Martsch, M. & Dachselt, R.: Going Beyond the Surface: Studying Multi-Layer Interaction Above the Tabletop.CHI 2012. Tominski, C.; Schumann, H.; Spindler, M. & Dachselt, R.: Towards Utilizing Novel Interactive Displays for Information Visualization. Workshop on Data Exploration for Interactive Surfaces at the ACM International Conference on Interactive Tabletops and Surfaces (ITS), Kobe, Japan, 2011. Spindler, M.; Tominski, C.; Schumann, H. & Dachselt, R.: Poster: Towards Making InfoVis Views Tangible. Poster at IEEE Conference on Information Visualization (InfoVis), Salt Lake City, USA, 2010. Spindler, M.; Tominski, C.; Hauschild, M.; Schumann, H. & Dachselt, R.: Novel Fields of Application for Tangible Displays above the Tabletop. Proceedings of the ACM International Conference on Interactive Tabletops and Surfaces (ITS), Saarbrücken, Germany, ACM, 2010. 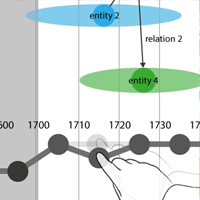 Spindler, M.; Tominski, C.; Schumann, H. & Dachselt, R.: Tangible Views for Information Visualization. Proceedings of the ACM International Conference on Interactive Tabletops and Surfaces (ITS), Saarbrücken, Germany, ACM, 2010. What: Survey of lenses in visualization. Novelty: Conceptual model of lenses, categorization of lenses according to data and tasks, survey of display settings and interaction modalities for lenses. Application: General concept for exploring various types of data, e.g., graphs. What: BodyLenses - an exploration into body-controlled magic lenses. Novelty: Using the user's movement and body features for lenses to accomplish data exploration on and in front of a large display walls. Application: General concept with various applications, e.g., image analysis and graph exploration. 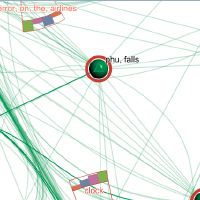 What: Mapping tasks to interactions for graph exploration and editing. Novelty: Conceptual view on tasks, interactions and mappings from tasks to interactions for graph exploration and editing. 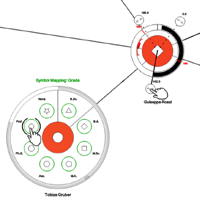 Application: General concept for developing systems for visual graph exploration and editing. Novelty: First interaction techniques for direct edge editing in matrices and matrices interlinked with node-link representations. Application: General concept for visual edge editing. An exemplary application is the correction of co-occurrence networks. What: Integrating exploration and editing of data attributes in graphs. Novelty: Supporting attribute encoding and editing tasks with pop-up interfaces. Application: General concept for exploring and editing graph attribute data. An exemplary application is the correction of personal data of social networks. What: Touch-enabled magic lenses - an investigation into fluid interaction for data exploration and lens parameterization. 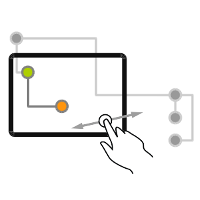 Novelty: Using an in-place menu along the border of a lens and a set of multi-touch gestures for lens parametrization. Application: General concept for lenses. An exemplary application is the exploration of social networks. 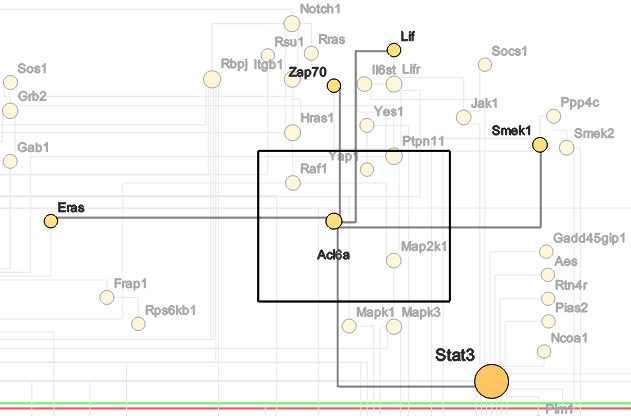 What: Combination of timeline and graph visualization for exploring the temporal relation of nodes in a graph. Novelty: Indicating a node's presence over time using time shadows and enabling user's to adjust the temporal level of detail using time beads. Application: Exploration of DBpedia data (people, locations etc.). What: EditLens - a lens technique for the visual editing of larger graphs. Novelty: Semi-automatic and region-wise editing of the graph's structure in node-link representations. 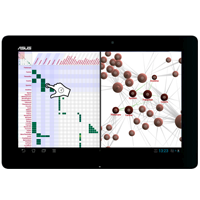 Application: Curation of gene-interaction networks. 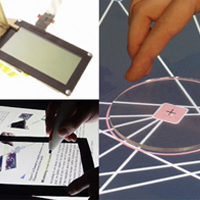 What: Transparent tangibles and displays - applying transparent displays on physical devices or tangibles on interactive tabletops for graspable exploration and manipulation. Novelty: Design space of transparent tangibles and displays including aspects of material, form factors, roles and functions, and prototypes for first usability evaluation. 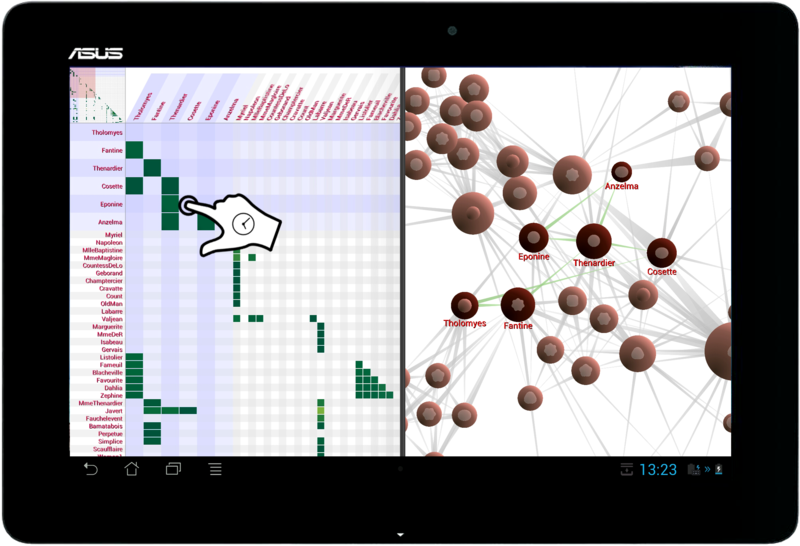 Application: Exploration of graph adjacency and active reading applications. What: Navigation recommendations for exploring hierarchical graphs. Novelty: Generalization of the user's focus and techniques for recommending horizontal and vertical navigation to intersting data targets visually in a node-link representation of a hierarchical graph. Application: General concept for supporting the exploration of large graphs.